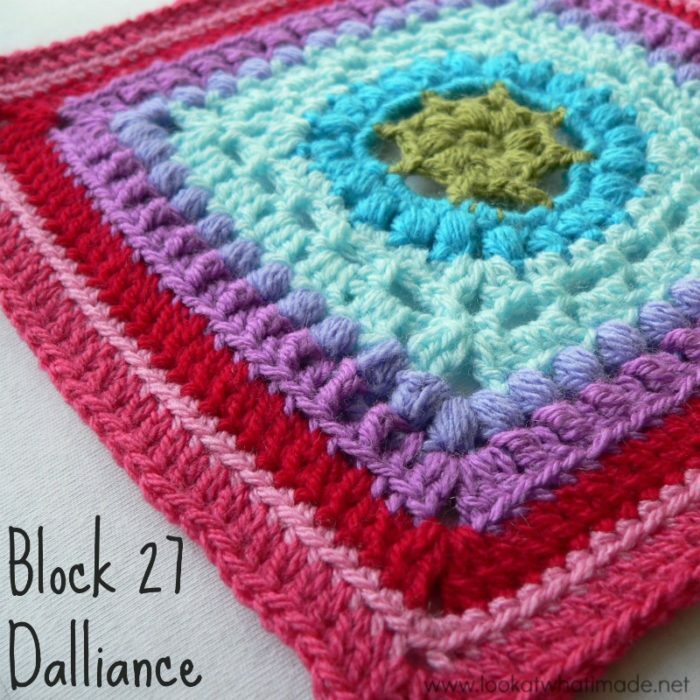 Block 27 of the Block a Week CAL (hosted by Kimberly Slifer) is Margaret MacInnis’ Dalliance Square. 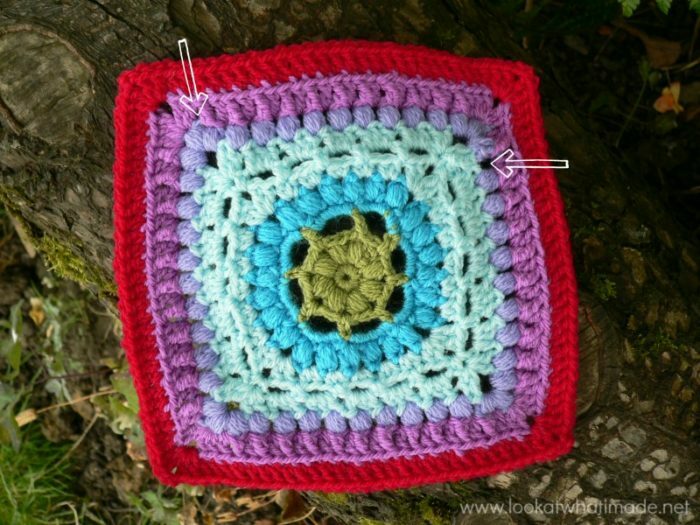 I am getting another break this week, because Margaret has already done a photo tutorial for the square. And to tell you the truth, I needed a break this week! I have included some photos of my square, and on them I have highlighted a few of the 17(!!!) mistakes I made while making this square. This is not a reflection on the pattern at all! 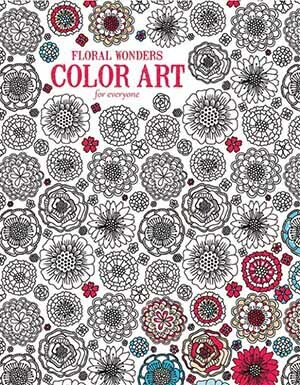 It is excellently written and the photo tutorial is clear and easy to follow. I have just been having one of those weeks. 3 out of the 5 of us have some sort of infection. It is not making for a very happy household, let me tell you. But onwards and upwards! So as I am not doing a photo tut this week, I thought you might enjoy seeing some of my mistakes, because we all make them and sometimes it’s nice to be reminded of that. 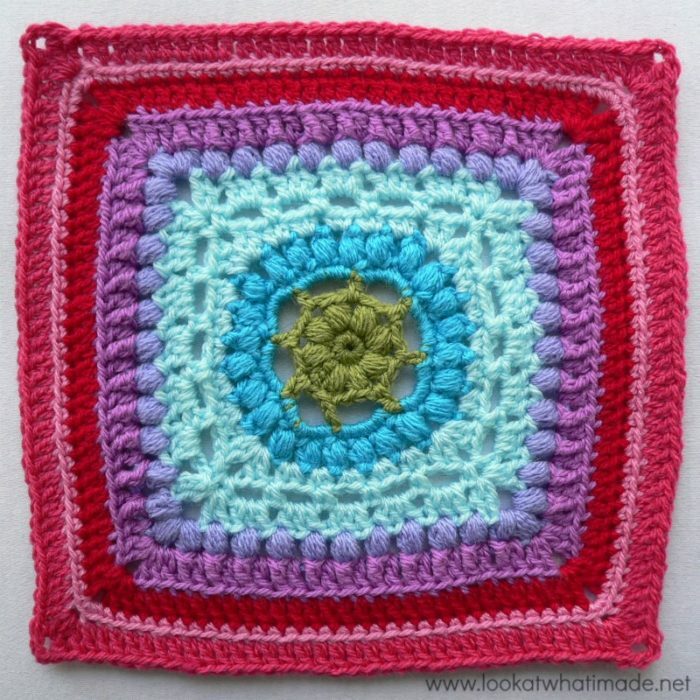 In this square you will see Margaret talk about Air Crochet. 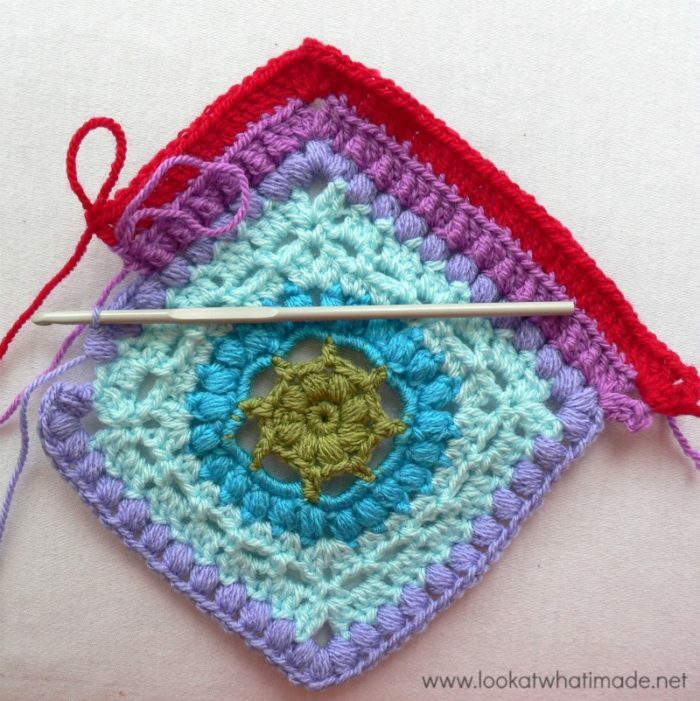 This is exactly the same as standing stitches, so when she tells you that you can work a round as Air Crochet (like Round 11), it just means that you can start with a standing stitch, which you should be well and truly used to by now. 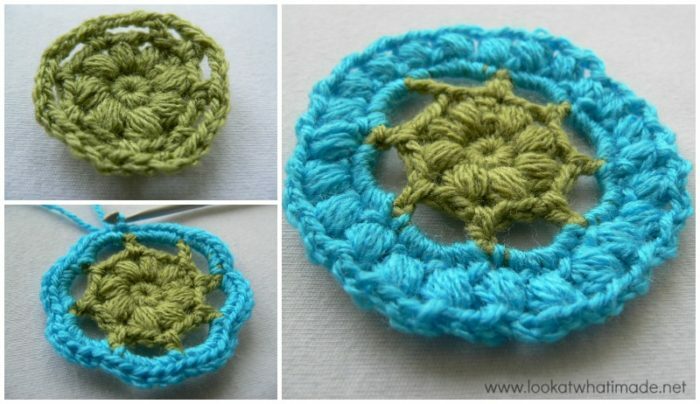 I have done a photo tutorial for the puff stitch. You probably won’t need it, because Margaret’s instructions are clear and easy to follow, but it is there should you wish to use it. 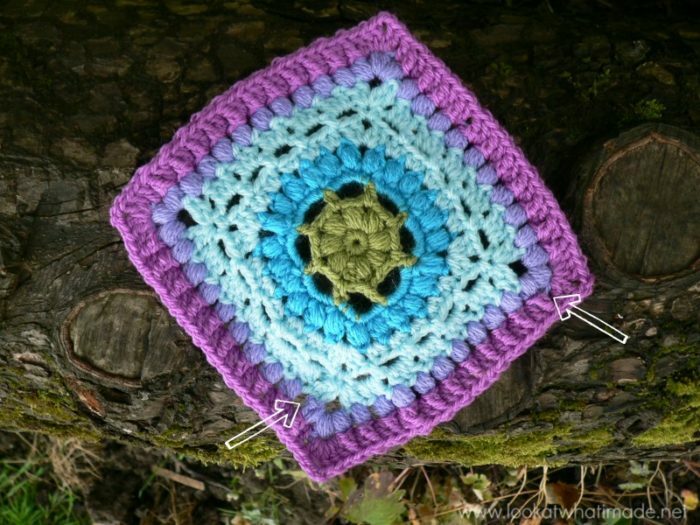 You can find the pattern for the Dalliance Square here on Ravelry. My square, using a 4 mm Clover Amour Crochet Hook (US G/6 UK 8) and double knit yarn, ended up being 8″ big (before the additional round). Remember to try out the invisible join, if you haven’t already. So Rounds 1 – 5 went without incident. I hate making puff stitches, but I absolutely LOVE how they look. I might just have to get over my aversion to a million yarn-overs and deal with it. Round 6 was good…and Round 8 was good. So I went back to the instructions and they do, indeed, tell you to ch-3 between the 2 sc’s in each corner. 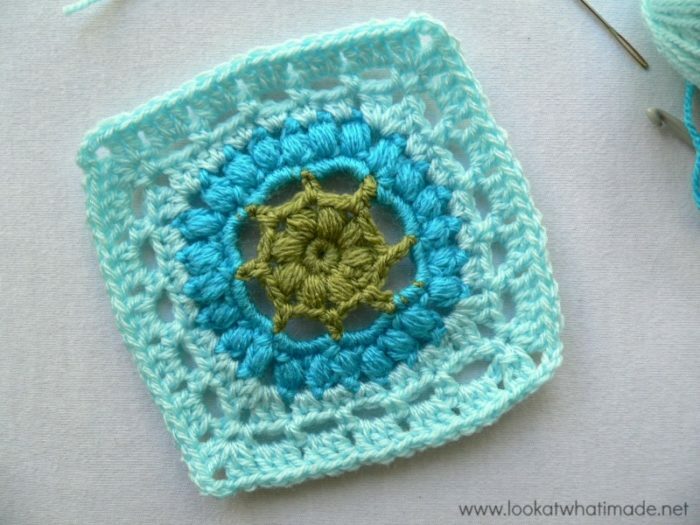 But my square is already complete and I am NOT frogging it again! Round 9 offers the opportunity for me to say my favourite sentence…Don’t forget to count that first hidden stitch! When you skip the first stitch, make sure that you don’t accidentally skip 2 st’s. Puff stitch rounds are a PAIN to re-do. Completely unbeknownst to me, I had omitted a puff stitch in Round 9 AND subsequently a few stitches in Round 10 (and some more for good measure). The moral of the story? Count your stitches in this round. You should have 16 dc’s and 11 fptr’s on each side. So I carry on, not realizing a thing…and still not counting my stitches (because I know what I’m doing!). And I keep carrying on…I am halfway through Round 12 when I realize that something is not quite right. I only have 27 st’s to work into on my second side. How can this be? So I frog Round 12 and lazy-man frog right back to Round 9…and this is not the first time that I am frogging this square! I fix, fix, fix, working into the back loops for Rounds 11 and 13, as suggested in the pattern. I used Option B for Round 13. 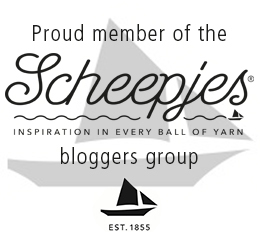 Please note that the stitch count for Option B should read: (148 st’s and 4 ch-2 spaces/37 st’s per side), not 156 st’s. And there you have it. One passable Dalliance square. One very frustrated me. I have added an Optional Additional Round 14 to get my square to the same size as the other squares. You can find the instructions for that HERE. Me, I’m a compulsive counter, almost an OCD. Comes from being a teacher and having “lost” a kid on an outing once, and from being an embroidery nut. So I count and count and count everything that can be counted. Doesn’t mean it’s easier finding where you went wrong, just that you know sooner that you went wrong. Still, it’s somehow comforting to know even a pro like you makes mistakes. I love your colour choices, except when you go slightly overboard with the turquoise, like in the outer rounds of Sophie’s universe. I like turquoise well enough, but as an accent colour, not the main one. I have used the same size hook on all the squares so far. And the Lucy pack of yarn. My first square is not the largest, so I am not sure how to add rounds to make them join properly. Charlotte, there are one or two squares where we have omitted rounds because they were way too big, and a couple that are the same size as the first. I have done a post highlighting which extra rounds I have added. Because personal tension varies from day to day it is quite possible that you might have to adjust some of the suggested additional rounds. If you try and keep your final round stitch count more or less the same it will make joining a lot easier. I love the colors you use in your designs. They pop! You are always so funny Dedri :) Hope your family gets better soon.